Glandyfi Castle01654 781238work Guest AccommodationGlandyfi Castle is a Grade 2 listed Regency gothic revival castle set high above the Dyfi estuary with dramatic views of the estuary and sea beyond. On the edge of the Welsh Biosphere and overlooking the RSPB reserve, the views from the front are of the estuary and the mountains of Snowdonia. At the back are equally enchanting views of long established gardens set beneath a backdrop or rugged welsh hills. The castle is set within 45 acres of land - some of it wild rolling meadowland, some ancient woodland and some, more formal gardens, bursting with fabulous trees and shrubs. In spring the grounds awakens to a carpet of daffodils, closely followed by a mist of bluebells and the riotous colour of long established camellias, azaleas and rhododendrons - many reaching over 5 metres in height. There are quiet lawns to relax upon, listening only to the chirping of the birds and the hum of bees, or mysterious pathways to explore amongst the woodland. And then of course there is the wonderful terrace. The perfect place to sit, sipping a drink and watching the sun set over the sea. Each day brings a different landscape as the tides change and the light transforms the mountains. To sit upon the Castle ramparts as people have for two hundred years, watching the dawn rise or the sun set, is to share in a magical experience and to feel the exquisite joy that comes from being at one with natural surroundings. There are 8 bedrooms available at the castle, ranging from huge - complete with four poster and painted cornices - to modest and charming, set amongst the eaves of what is reported to be the oldest part of the building, probably pre-dating the castle. All eight of the bedrooms are very stylish and effortlessly elegant, yet each is unique. Bathrooms also range from extravagant with circular Jacuzzi bath to attractive and functional. The oak panelled dining room with its vaulted ceiling and chandelier is grand enough to make a statement whilst retaining an air of warmth and intimacy. The octagonal library is flooded with light and has breath taking views. With its marble fire place and cosy armchairs it is the ideal room to snuggle up in and witness the drama of the welsh mountains (and weather!) from a deeply satisfying and cosseting fireside. The Glazed Conservatory is a stunning room - more medieval than Regency - yet contemporary and full of light and warmth. It is a delight to breakfast amongst the lush plants overlooked by the suit of armour. Glandyfi Castle offers luxury hotel style service without any stuffiness or restrictions. The aim is to be guest led rather than routine led. Service is customised to suit the need of guests. We recognise that not everyone wants to eat their meals at specific times and we accommodate personal wishes wherever possible. Our strength lies in attention to detail and being empathetic to the needs of our guests at any particular time. 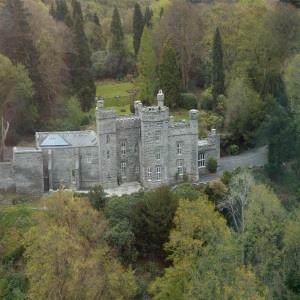 Glandyfi Castle is a Grade 2 listed Regency gothic revival castle set high above the Dyfi estuary with dramatic views of the estuary and sea beyond. On the edge of the Welsh Biosphere and overlooking the RSPB reserve, the views from the front are of the estuary and the mountains of Snowdonia. 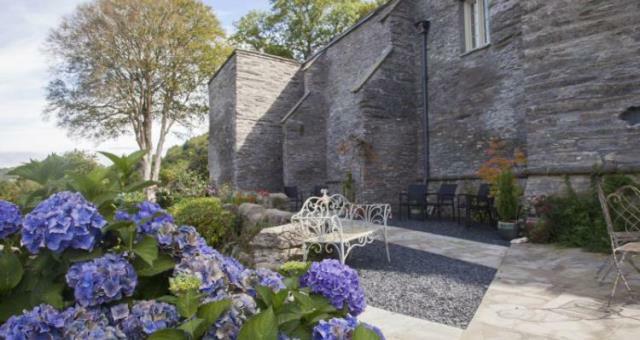 At the back are equally enchanting views of long established gardens set beneath a backdrop or rugged welsh hills. Our beautifully decorated and comfortable rooms, real fires and fine food, together with an honesty bar ensure that the experience of staying in an unique country house such as Glandyfi castle is informal and relaxed. There are no pretensions of grandeur - just pure luxury and relaxation. With prior notice, the services of a person trainer can be arranged to organise a fitness regime within the castle grounds. With prior notice, the services of a fully trained and experience therapist can be arranged to offer Hot stone massage, Aromatherapeutic massage, Indian Head massage, Reflexology and Reiki healing in the privacy of guests own rooms. Children welcome from any age. The castle entrance is on the A4971 between Machynlleth and Aberystwyth. It is approximately 12 miles from Aberystwyth by car and 6 miles from Machynlleth.